withe the equality if and only if the triangle is equilateral. 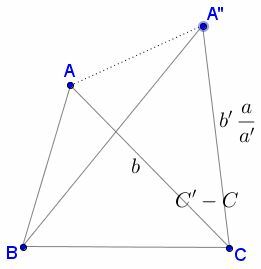 For other proofs see D. Pedoe, "An inequality for two triangles," Proc. Cambridge Philos. Soc., vol. 38, part 4, p.397. Note that (*) is symmetric in $ABC\;$ and $A'B'C',\;$ making $a,b,c\;$ and $a',b',c'\;$ interchangeable.